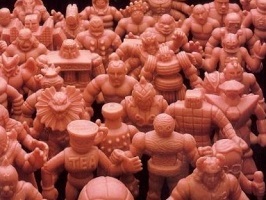 As I’ve said before, I have had a tumultuous relationship with collecting the final M.U.S.C.L.E. figures for a Master Set and completing the UofM Figure Guide. But the kindness of other M.U.S.C.L.E. collectors changed that relationship. The Green #166 and Purple #107 made me excited to finish the collection. The Magenta #161 Miracle did what I considered impossible and transformed my collection into a family event and piece of our history. Red #68 and Salmon #85 made me want to be a better person. Red #134 proved that civility can still exist when selling a figure. If you have any of these final five figures, then please email me. Thank you in advance to anyone that can help! This entry was posted on Wednesday, April 17th, 2019 and is filed under History, Research, UofM News. You can follow any responses to this entry through RSS 2.0. You can skip to the end and leave a response. Pinging is currently not allowed. Amazing. You can count them on one hand now! 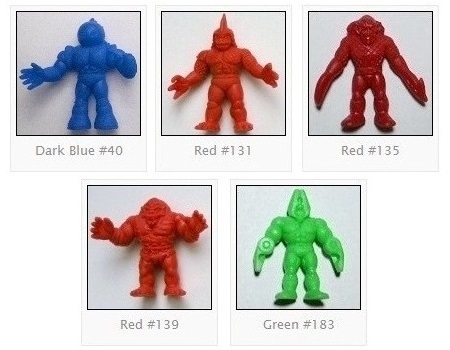 Dark Blue 40 and Red 139 have shown up in the last year or so. These figures are out there. Good stuff.